Secure. Stronger than wooden doors, fitted with multipoint locks as standard. Virtually maintenance free. Easy to clean and no need to paint. Energy efficient. uPVC and double glazing offers improved insulation, helping to reduce the cost of energy bills. Quieter. Effective at reducing outside noise. An affordable and low maintenance choice, uPVC doors keep your home warm, quiet and secure. Choose from a vast range of colours, finishes and designs. 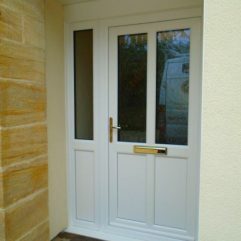 Are you interested in our uPVC Doors? Then contact us today to discuss your requirements for a free no obligation quote.